While New Orleans Mayor Mitch Landrieu spent the weekend at the Conference of Mayors meeting in south Florida, people continued to die and suffer amid the violence on the streets of his city. While he blathered about American cities taking up the tenets of the Paris Accord, people bled on the sidewalks. While Landrieu talked about Russian interference in the presidential election that kept him from succeeding his father as HUD secretary, innocents felt the literal pain of his ineptitude. As a part-time resident of the Crescent City, I am livid. I had dinner Saturday night with a business colleague mere blocks from where that brutal assault took place. After we dined we walked a few blocks deeper into the Quarter for drinks and conversation. We parted around 11 p.m., him in an Uber to his home Uptown and me on foot, 10 blocks to my downtown apartment – the weekend abode I’ve vowed to give up after eight years when the lease expires. At that point I was unaware of the attack on those tourists. Still, I was hyper-vigilant. The street was still crowded with pedestrians, offering some comfort, but my eyes darted left to right, right to left, as I strode through what should be the safest part of town to my weekend home. The French Quarter is safer, right? It’s the tourist area so it has extra protection. It has extra taxes to pay for State Police protection, because while Landrieu told NOPD he couldn’t pay them more or hire more of them, he simply added a tax to hire state officials – an inexplicable paradox. It’s the area that has barricades to prevent Nice- and London-style attacks on innocents. We’re supposed to be safe there, right? No. We’re supposed to be safe everywhere. Realistically, of course, that’s not possible. Crime happens, and it happens everywhere. What should not be happening, however, is that a city is so overrun with lawlessness that people are beaten nearly to death in the streets, that literally hundreds of people are shot – fatally or injuriously—or that children catch stray bullets while thugs roam free. What shouldn’t happen is that the leader of a relatively major city gives speeches 1,000 miles away in which he says that statues are “virtual murders,” that the Paris Accords are the responsibility of America’s cities now, that Russians interfered with the presidential election (and, therefore, with his appointment to a Cabinet post). In the early ‘90s, I was a Landrieu advocate in his first run for mayor. I thought he was the best of the lot – and it was a sizeable lot. By Election Day that year I had changed my mind and voted for Lambert Boissiere in his failed bid. In the runoff, I voted for Donald Mintz, in the election Marc Morial ultimately won. A year later, I moved to St. Tammany Parish, where we’ve had nine murders so far this year. Nine, with a population of nearly 250,000. Nine, in a parish with at least as many guns as New Orleans, and with far fewer statues. NINE—All tragedies of violence, all disturbing, none random. When I hear sirens from my living room or balcony I assume vehicle accidents or fires. When I hear sirens in New Orleans I almost run for cover. 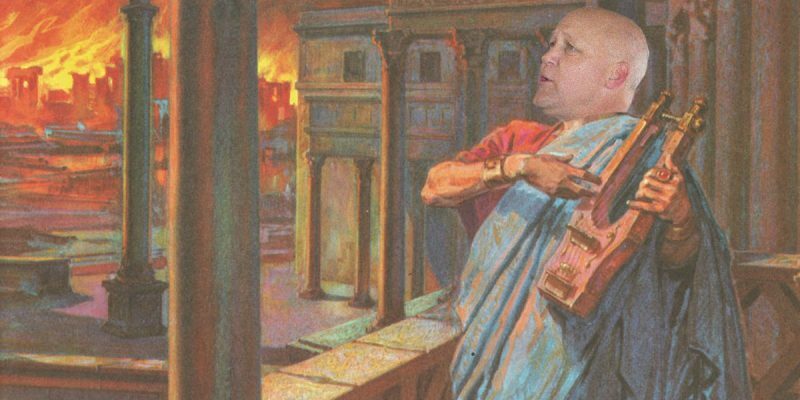 While Mitch Landrieu plays politics and postures for his next position, his city flows with blood. His hiring freeze on police, his wasteful spending, his pure and utter ineptitude guarantee him a special place in hell – and I don’t personally even believe in such a miserable afterlife. Some commenters say that as a suburbanite – even one with a downtown abode – I have no standing to criticize. To them, my first words are unsuitable for print. My second words are these: Where I live, where I vote, where I pay most of my taxes, we hold elected officials accountable. We vote based on performance. We organize and make change. In New Orleans, the status quo seems OK.
Marchers lined the streets – both pro and con – about inanimate objects on pedestals. No one rises up about the crime, the violence. In the end, the Crescent City will get what its voters deserve. The next election is this year, October 14, and the next mayor will take office almost seven months later. It will be very interesting to see who the voters choose – a leader who embraces public safety, commerce, community engagement, fiscal responsibility and transparency, and most of all real solutions to the violence, or someone who represents more of the same. One candidate is waiting in the wings to be Mitch’s heir. (More on her later.) It’s too late to show Mitch the door, but I hope the voters don’t embrace a like-minded successor. The future of the state’s flagship city and the entire region hangs in the balance. Whether blood continues to flow in the streets is in the hands of the voters. God help them. God help us all.